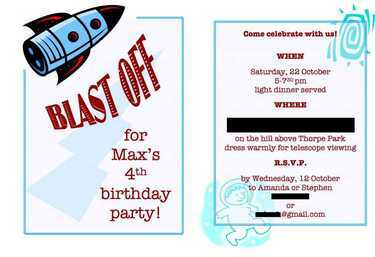 Max's birthday party was Saturday, and it went off really well. We had about 16 little kids there, ages 1-5. They spent most of the time running loops around everyone and having a great time. I had games planned, but they were having fun just running so we punted on the games. The rainbow streamers went over well, and probably contributed to the race-around-the-loop mentality at the party. Obviously if you run faster the ribbons stream out better (Max demonstrates in the image above), so that's what we want to do! The place we were having the party had limited setup and cleanup times, so we had to set up really quickly, then tear down quickly too. Our poor friends Brian and Blanche didn't realize what they were saying when they said "sure, we'll help with the setup." At the end of the night, my pedometer said 17000 steps. I usually put in 8000-10000 in a day, and that's only if I go on my 1.5 mile walk in the morning. Anyway, it was good to have this feedback, because I felt justified in being totally and completely wiped out. Lots of progress has been made on the party-planning front, which is good because I'm now ~1500 miles away in DC for a business meeting. 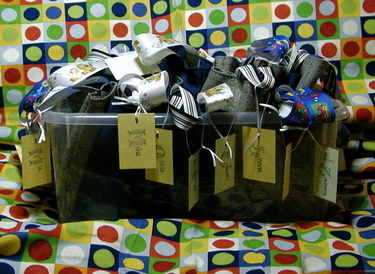 I finished sewing the rainbow streamers and the gift bags, and all the gift bags are stuffed now. I've also bought some of the food and sent out a call for crock pots for this weekend. I get back Wednesday evening, and from then on it's baking and cooking, with a few interruptions for work. So here are pictures of the rainbow streamers. These started with an idea to make a little toy rocket with ribbon coming out the bottom to simulate the flames on liftoff. This was fairly successful, and then led to other streamer ideas. From left to right, there are stars, rockets, crescent moons, and rabbit-in-the-moons. The idea for these is to give them to the kids as they arrive and let them run around with the streamers. 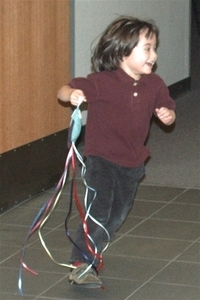 This seemed to work ok for Max and the prototype streamer, we'll see if it scales up to a large group of kids. 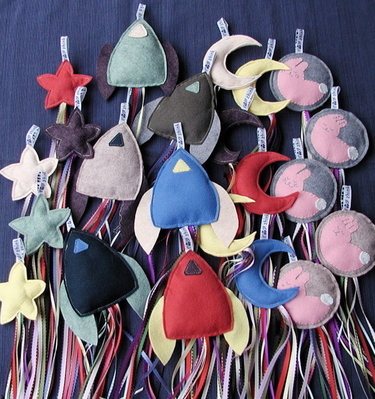 On the left are the rocket ship streamers, and on the right are the rabbit-in-the-moon streamers. The rabbits are my favorites. Are you wondering what the rabbit in the moon is? Well, it's kind of like the man in the moon, seeing a picture in the full moon from the pattern of light and dark. I've never been able to figure out the man in the moon, where he's supposed to be. Perhaps this is because my mom is from Japan and only knows about the rabbit, so she couldn't tell me where to look for the man. Anyway, the rabbit seems to be an asian-culture thing. Oh, a google search tells me the Mayan also saw a rabbit in the moon. There's also a band called Rabbit in the moon. But I digress. Each rabbit has a different embroidered expression. FYI: the star and crescent moon streamers were the hardest to sew, and I think they turned out the least satisfactory. Goody bags. Or is it goodie bags? Let's just call them treat bags and avoid the whole issue. Two color combinations. Blue bag with yellow duckie ribbon handles, and grey bag with blue car ribbon handles. Oh, and a black stripe variation for both colors of bags. 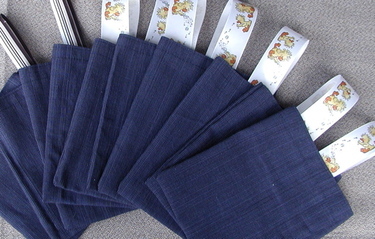 The last picture shows the bags all stuffed and labeled. And the overly bright fabric they're sitting on is going to be the table cloth. Found at JoAnne's in the upholstery section, on sale. I think that next year it will morph into treat bags. I've made an iMix (basically a playlist) for the party. If you have Apple's iTunes, you click on Music Store then iMix under "Inside the Music Store", then do a search for "Max's 4th birthday party". [Note: that's currently not working for me, but that's how you should be able to access it. Alternatively, you could go to this link, which seems to open up the iMix in my iTunes. If you're not using iTunes, I don't have any suggestions. Strangely, it didn't grab all the songs I had in my playlist. The help page says that if the song doesn't exist at the music store it won't list it. But I know some of the missing songs are there, they just have slightly different information. 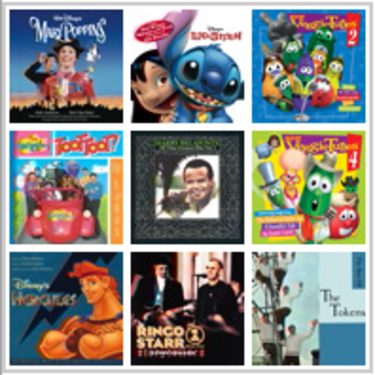 Most are from the VeggieTales Jonah album. And of course I've included the Arlo song. OK, that's all for tonight. Must get some sleep before tomorrow's meeting. My good friend Aurora had a baby last Thursday. Robert Vincent is so adorable! 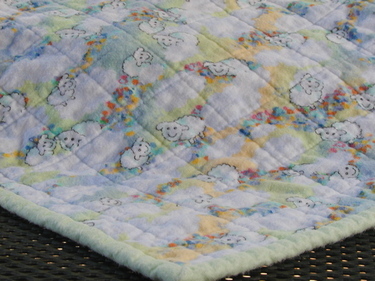 Here are some pics of the quilted blanket I made for him. Just two pieces of flannel with some batting in between. I did the quilting myself, just straight parallel lines. Sounds simple, right? Well, I did discover that I couldn't free-sew a straight line and had to pull out some stitching. I did consider going for the wavy Denyse Schmidt style, but it wasn't wavy enough to look cool, just a little off to make it look like a mistake. I finally got the ruler and drew a straight line on the top, then used the extension bar on my walking foot to keep all the other lines roughly parallel. 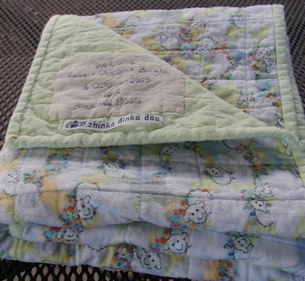 The binding is the same as the backing fabric, a pretty light green. I love the sweet little sheepies on the top, they're so cute! My basic-quilting teacher made a big point of always signing our quilts, so I embroidered a little signature patch with his name, his birthdate, and my name. I just did backstitch and it doesn't look as neat as I'd like, but it definitely has that homemade feel. I like how the quilt as a whole turned out. Max's 4th birthday is coming up fast. We've planned the party for 22 Oct, so we're now at 17 days and counting. Since I have several work things popping up before that date, I actually started planning ahead of time this year for the party. Rather than running around in headless-chicken mode and grabbing things out of closets the day before guests arrive. Wow, it almost doesn't feel like me. I'm sure I'll manage to stick in some last minute, procrastination-related things, though. I have to be true to myself, right? So last night I stayed up until 1am designing and printing the invitations. (I wasn't the only one up until 1am on a recent weeknight, Myra was too. It feels good to have company, even if it's a different night and quite a few miles away.) I had to do them this early because I need an RSVP because there will be food. I had quite a few tussles with the printer. Apparently it gets overheated after printing a few, and must rest. So I didn't get all of them printed last night, but I did get one side printed, and all the envelopes addressed. I'll finish them later today. I feel a little silly blacking out key details, but there it is. My original concept for this included all hand-drawn art. I generally don't like my drawing, but I have gotten a fair amount of practice with rockets over the last few years and have come to terms with a few of my renditions. But, I really wanted to finish these last night, and there is no scanner at home, so I had to go with clip art. I have to get one of those drawing tablets sometime. Does anyone have one that they like? Since it's an evening party, we're planning to serve dinner. We've started on the experimentation/freezing already. 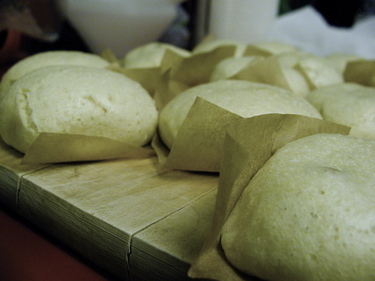 Here are some steamed buns that we made last weekend. Along with my steamed-bun-making helper. 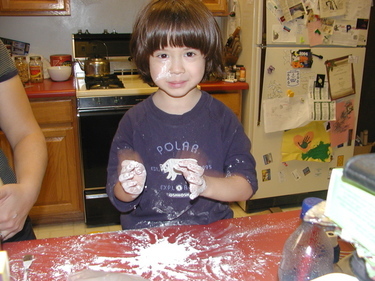 Actually, he was more interested in moving flour around the countertop, but that's ok.
And look at my DONE list! This afternoon is my 2-hour craft time, so hopefully I'll be able to do a few more things today. Oh, and I suppose I should write the talk that I'm giving on Monday. But it's so much more fun to plan a party!